As part of implementing the new unified themes across the network, we're gradually rolling out updated site themes for each site. 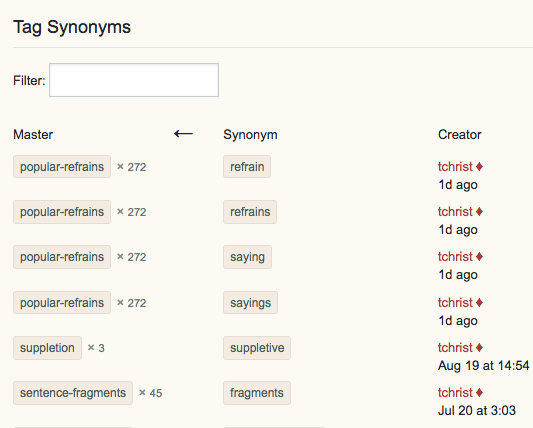 As of today, we have enabled your updated site theme for testing. Click here and check the "Beta test new themes" option. This will turn on the new theme for all sites that have one in testing, including this one. Here's more info on how to opt in. You can uncheck the box to revert to the older theme until the site is live for everyone (note, it will take a few minutes to go into effect). What type of feedback do we need? 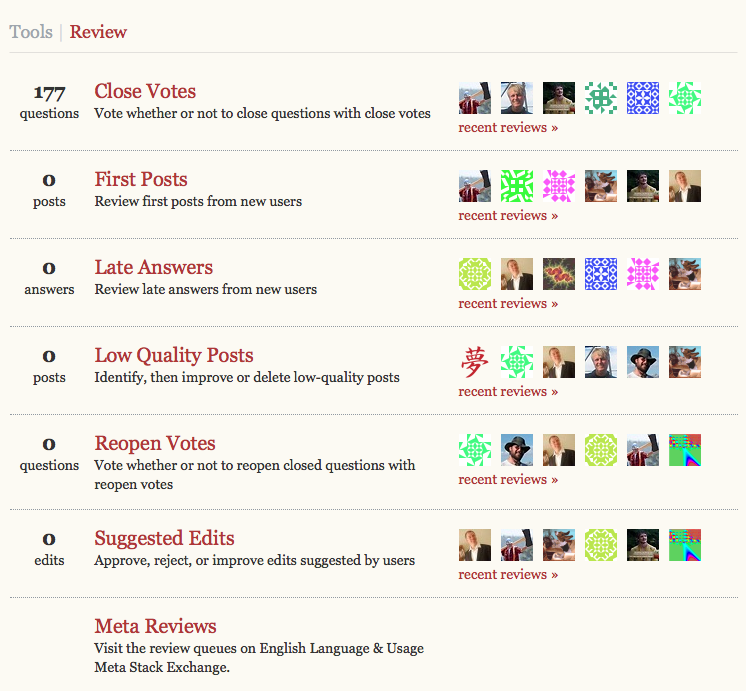 Please help us look for issues/bugs related to the theme design and how we have mapped the old theme to the new. This needs to be done within the limits of the new unified theme. 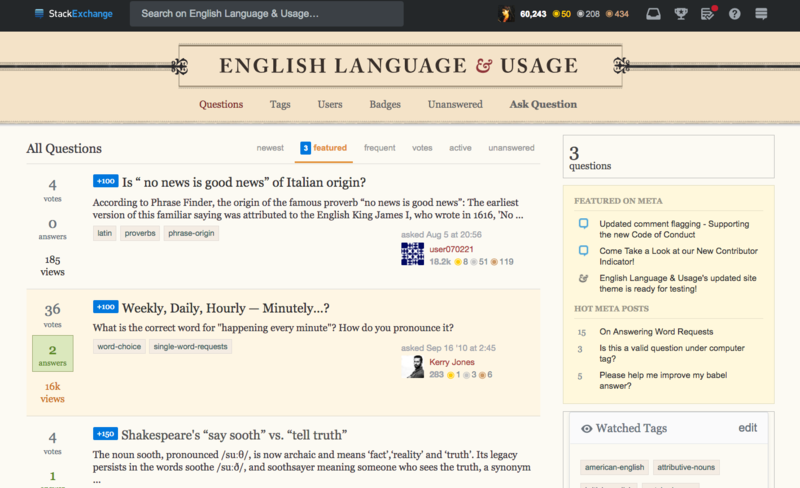 If you have concerns or issues regarding the left nav or the overall approach we are taking to theming, then this Meta Stack Exchange post is the right place for feedback. As you may notice, there are some unique design elements like voting arrows and tags that are being standardized in this process. Keeping these custom elements makes our ability to maintain the sites too complex and, while we're very sad to see them go, we're in a difficult position of needing to make the site designs work together so that we can continue to address feature requests and bugs that will make your Q&A experience better. This is addressed in a Meta Stack Exchange post if you want more detail. If you're like, "What the heck are you talking about? 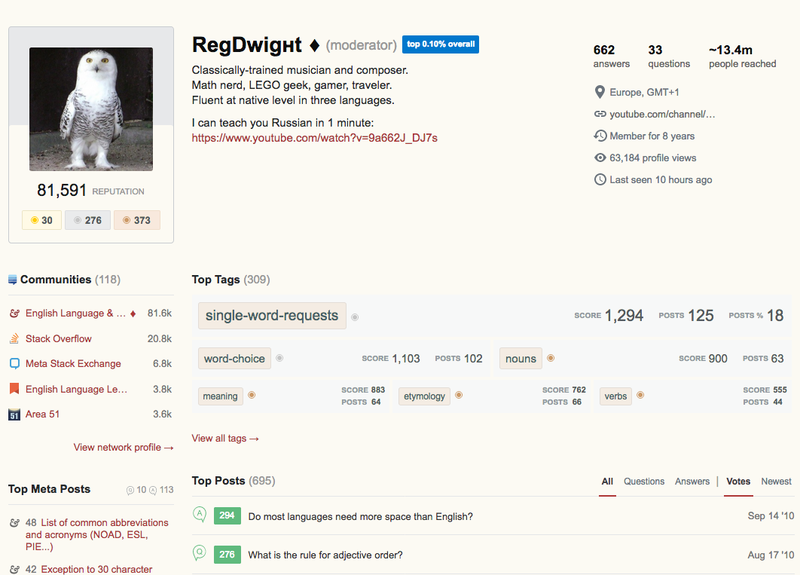 ", then you should read the Meta Stack Exchange post entitled Rollout of new network site themes (and maybe the posts it links to for the full background). Thanks so much for your constructive feedback! 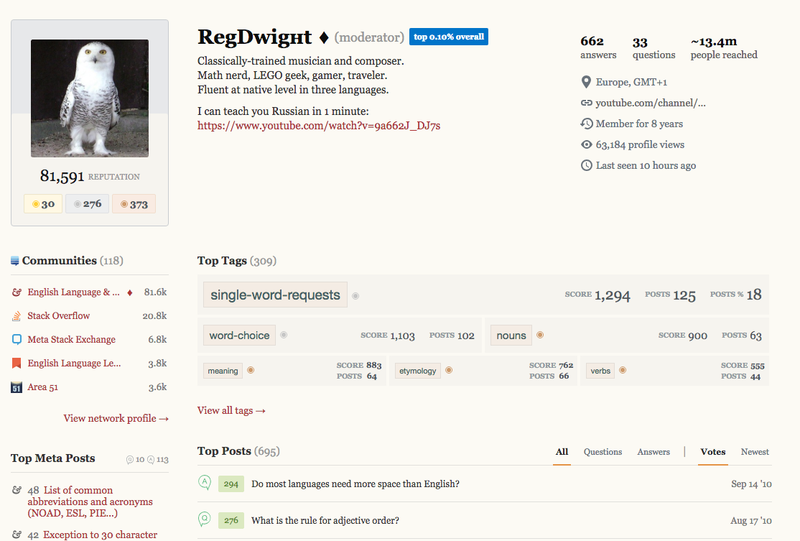 In 2018, the new flat theme is dull and one dimensional. The elegant Georgia font has been sacrificed. The quaint antique style and flourishes have been replaced by bands, lines and boxes. The theme colour, which was charming and reminiscent of a bygone era, now succeeds in accentuating this blandness. Our once glorious ampersand (the Baskerville's italic ampersand symbol) has shrunk and become incongruous with its new austere surroundings. The website completely lacks personality and is superbly anonymous. The heading ‘Top Questions’ is too obtrusive. It completely swamps the banner. 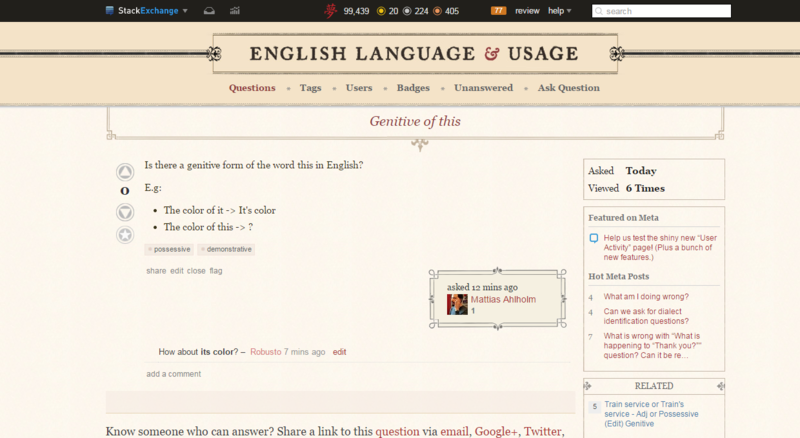 Unless we enable the left navigation on the new theme, we do not see the preview of questions. The links on the main page displaying badges, frequent, users and our greatest self-promotion asset, votes, are invisible. Casual visitors might risk not seeing EL&U's top questions and the corresponding top answers, which would be a disaster. Here is a screenshot of the main page complete with left navigation and coal black top bar. Why is the web site's name pushed to the left? Because all sites must have this placement moving forward. The goal of this update is to make the base LESS/CSS for the entire network as similar as possible, which requires that the logos all have the same positioning. Having these elements be the same makes it so that we can more easily roll out some of the feature requests that have been sitting around for years without risking breaking a chunk of the sites. Why is the subheading larger than the actual logo? Why do we have different fonts on the same page? What was the reason for downsizing the ampersand? Can we please eliminate, replace or shrink the ornamental floral elements to their former size? Will that dead space in the left margin one day be filled? Ads? Jobs? 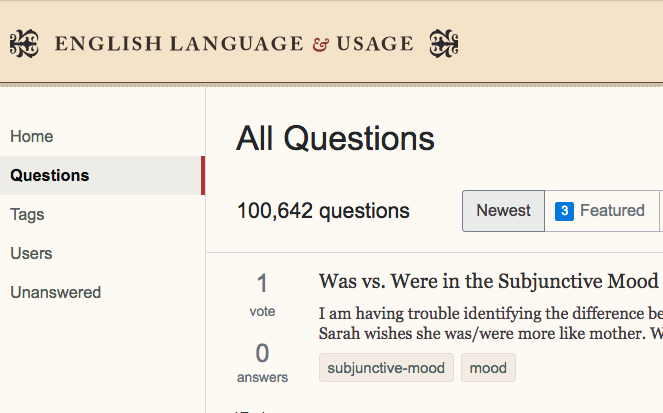 There is another way to access the questions page without enabling the left navigation, there's a hamburger menu (☰) on the top left of the page this allows you easy access to the Questions, Tags, Users, and Unanswered pages. I would recommend disabling left navigation and using the left hamburger logo/icon to switch pages. I do not understand why there are now three ‘hamburgers’, and why the hamburger on the left does not brighten when it is clicked. In my modest opinion, due to its gloomy appearance, it is easily missed and its utility overlooked. When you visit a page, the question title is not red. 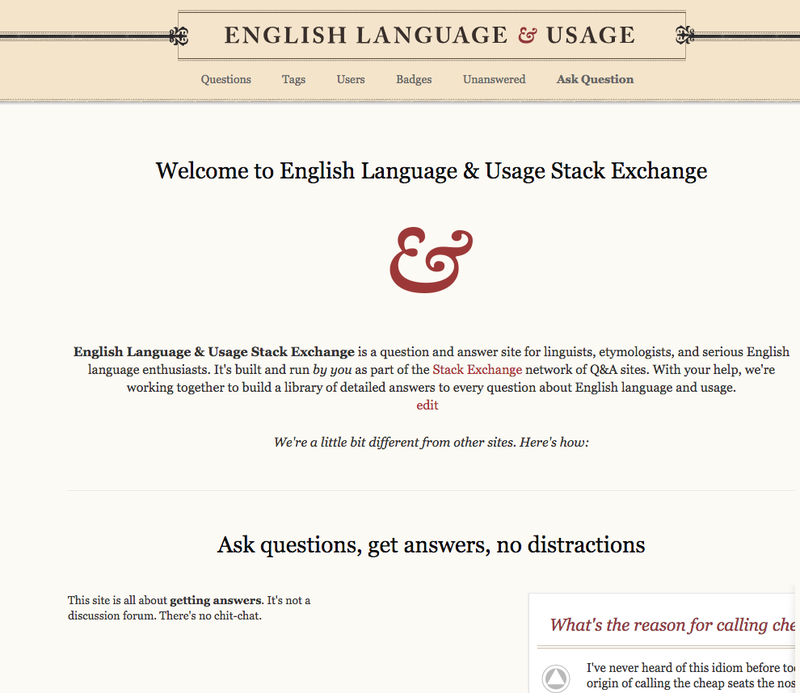 Why do some parts of the stan­dard theme use dif­fer­ent fonts than the rest of the site? Graph­ic De­sign up­dat­ed site theme is ready for test­ing! We’ve lost our el­e­gant Geor­gia face on most of the site. It’s been re­placed by Ari­al of all things. Those two faces are ɴᴏᴛ ᴍᴇᴀɴᴛ to go to­geth­er, and they do not. Geor­gia is sup­posed to pair with Ver­dana, not with Ari­al. Other­wise the char­ac­ter is all wrong, like chalk and cheese. 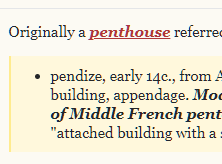 If after click­ing on that im­age to see it at full width, its text still looks too small, that’s prob­a­bly be­cause the new “re­spon­sive” de­sign is not ac­tu­al­ly re­spon­sive enough to rec­og­nize large view­ports and re­size the type­face and ad­just the mea­sure com­men­su­rate­ly — and you’re us­ing a wide-screen mon­i­tor like I am. This is all cov­ered in the afore­men­tioned linked MSE post № 2. Us­ing what there is to best ad­van­tage al­most al­ways means us­ing less than what is avail­able. Basker­ville, Hel­veti­ca, Palati­no, and Times Ro­man, for ex­am­ple – which are four of the most wide­ly avail­able type­faces – are four faces with noth­ing to of­fer one an­oth­er ex­cept pub­lic dis­agree­ment. None makes a good com­pan­ion face for any of the others, be­cause each of them is root­ed in a dif­fer­ent con­cept of what con­sti­tutes a let­ter­form. If the avail­able pal­lette is lim­it­ed to these faces, the first thing to do is choose one for the task at hand and ig­nore the oth­er three. Basker­ville is an English Neo­clas­si­cal face de­signed in Birm­ing­ham in the 1750s by John Basker­ville. It has a ra­tio­nal­ist ax­is, thor­ough­go­ing ge­om­e­try and a del­i­cate fin­ish. Hel­veti­ca is a twen­ti­eth-cen­tu­ry Swiss re­vi­sion of a late nine­teenth cen­tu­ry Ger­man Real­ist face. ... The heavy, un­mod­u­lat­ed line and tiny aper­ture evoke an im­age of un­cul­ti­vat­ed strength, force, and per­sis­tence. The very light weights is­sued in re­cent years have done much to re­duce Hel­veti­ca’s coarse­ness but lit­tle to in­crease its read­abil­i­ty. Time Ro­man – prop­er­ly Times New Ro­man – is a his­tor­i­cal pas­tiche ... It has a hu­man­ist ax­is but Man­ner­ist pro­por­tions, Baroque weight, and a sharp, Neo­clas­si­cal fin­ish. For rea­sons I won’t get in­to here, what he says about Hel­veti­ca you can ap­ply in equal mea­sure to Ari­al, and what he says about Times New Ro­man you can ap­ply to Georgia. It’s fine to mix sans and serif for dis­tinct sec­tions (like cap­tions for ex­am­ple), but please pick two type­faces that have the same no­tion “of what a let­ter­form is.” So they should both be from the same tra­di­tion, in our case prefer­ably an old-style Re­nais­sance one with a hu­man­ist (oblique) ax­is, large aper­ture, crisp ter­mi­nals, and with an ital­ic equal to and in­de­pen­dent of the ro­man rather than just an oblique with a slant ver­sion of the same ro­man let­ters. 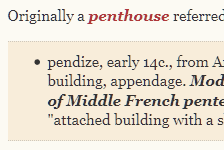 And both should have old-style text fig­ures and such. Georgia you can say much but not all of that about; Ari­al noth­ing. An ex­am­ple hu­man­ist pair­ing would be some­thing like FF Scala Sans to go with FF Scala. I re­al­ize those two in par­tic­u­lar are not avail­able to us, but they pro­vide a sound mod­el to em­u­late in pair­ing two linked faces done in the self­same hu­man­ist tra­di­tion. It sticks out like a sore thumb now. It doesn’t make sense giv­en that we’re a serif site. This looks like a mis­take. It cer­tain­ly does not look good. It’s al­so ly­ing: we aren’t dif­fer­ent from any­body else. We are ex­act­ly the same. Now we don’t even have an ital­ic font. The new sans has no ital­ic on­ly oblique, so you don't have the right let­ter­form for the a, just an a that’s slant­ed. 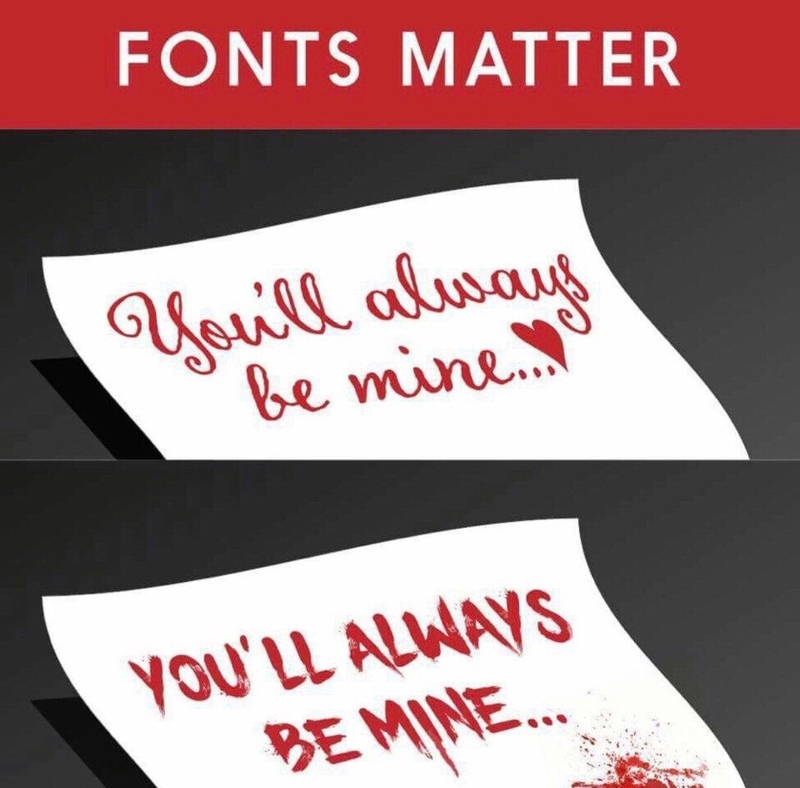 Use some sans that has a re­al ital­ic for good­ness sake! 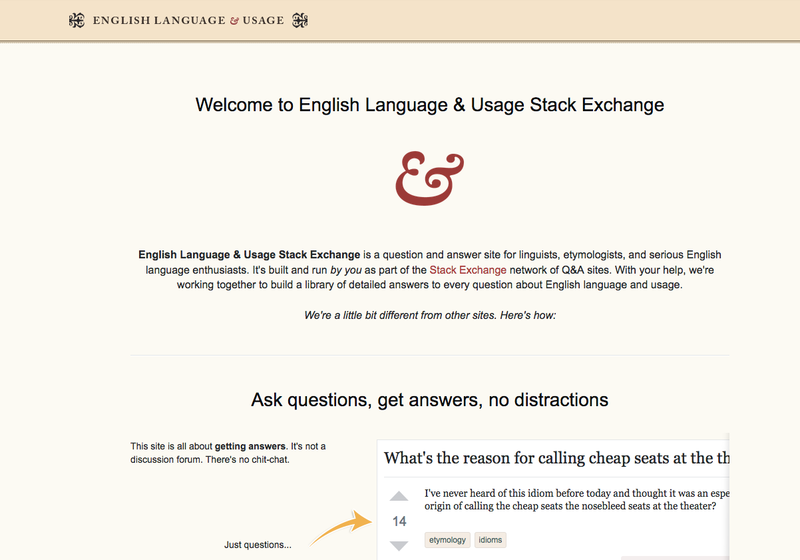 I don’t know what that stuff is, but it isn’t English Lan­guage & Usage. It’s com­plete­ly re­moved all site flair al­to­geth­er. This is just a beige ver­sion of Stack Over­flow. It is not taste­ful and it is not el­e­gant. It is the op­po­site of those things. Why? What does de­stroy­ing our fonts buy some­body that is so im­por­tant that we should suf­fer this ig­nominy? This all seems care­less and wrong, a gross mis­take. It’s harm­ful. Why? Geor­gia and Ari­al don’t even go to­geth­er. They’re from dif­fer­ent tra­di­tions. You need to pair one hu­man­ist/old-style face with an­oth­er. Or even a neo-hu­man­ist or tra­di­tion­al pair. But you don’t mix chalk and cheese. This is all out of whack. And no, you can­not pair Times New Ro­man with Hel­veti­ca ei­ther, for the same rea­son. Nei­ther of those sans faces pair with ei­ther of those serif ones. Please read Chap­ter 6 of The Ele­ments of Ty­po­graph­ic Style, “Choos­ing & Com­bin­ing Type”, for why this mat­ters. Us­ing a sans font on ELU — in par­tic­u­lar, this new hodge-podge ran­dom mix­ing of Ge­or­gia and Ari­al with nei­ther rhyme nor rea­son — looks like crap. If we can’t have Geor­gia, just be hon­est and make it Com­ic Sans and watch peo­ple re­sign. I’m se­ri­ous. Stick­ing us with some bor­ing, in­el­e­gant font that is not our site’s font is non-ne­go­tiable. We need no sans here any­where we didn’t have it be­fore. This is ob­vi­ous­ly some­thing that can be fixed. And should be. 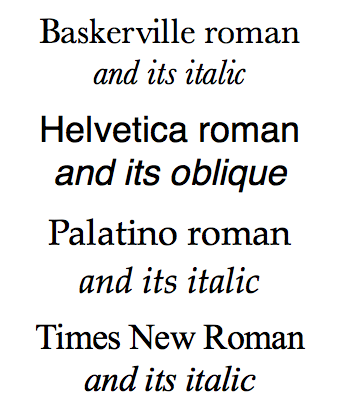 Plus for the sans, pick one that has an ac­tu­al ital­ic, not an oblique. Pick a serif and a sans that ac­tu­al­ly G O  T O ­G E T H E R for good­ness’ sake. That usu­al­ly means by the same de­sign­er, the way Geor­gia and Ver­dana were made to be paired. Please restore all the new sans places back to the old serif! There are plenty of tools out there that tell you whether the contrast is tolerable or not. Please use them, because this clearly is not. There's a weird problem causing the offset letters in the banner. It's being looked at but will be fixed (on all of the sites getting hit by it). 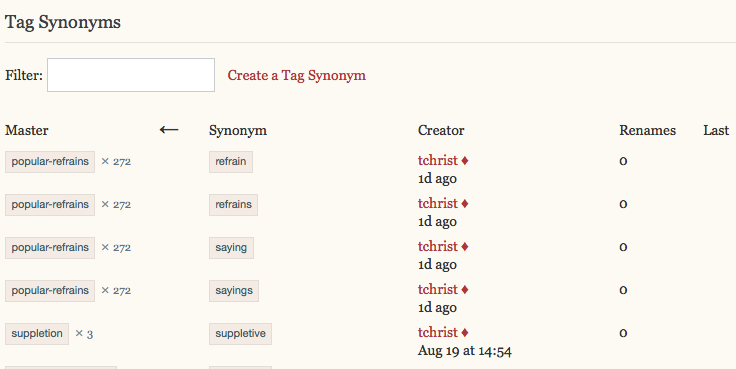 The status completed tag on tchrist's bug report was because the site theme was fixed back to what it was, not that this version of it was fixed. There was an odd slippage of the image for the new version of the site into the old/current site design - that's what was fixed. As to the general banner, the placement of the site name has to be on the left, not centered, but I've seen a mockup of an updated version that I really hope y'all will like (more, anyway). It is, essentially, identical to what it currently is, but not centered. This includes making it slightly larger than the disliked version but still a bit smaller than the old, to fit in the new top bar height. The ornaments cry out for centring, but everything is just pushed to the left. It's horrible. It's not just bland, it's cheap and nasty, and not a patch on the original design. That was centred and used a larger distressed font with authentic spacing and was obviously the work of a talented designer really well-designed. However, given that the overall concept is a done deal, however badly envisaged, I suppose we will need to make the best of it. While I don't make my living from design, I think I would suggest losing the ornaments altogether. That will allow the lettering to be made larger, like Christianity's header, and possibly mean that Caslon Antique can reappear, too. It would be really good if something could be used on the right-hand side, like the Christianity cloud. Perhaps one of the ornaments could go over there — larger and cropped, as a nod to the old style? Or maybe an artistic scan of part of a page of H.W. Fowler's Modern English Usage, since the first edition is well out of copyright. What is good is the decorated border, but it's not enough to detract from the overall blandness, I'm afraid. 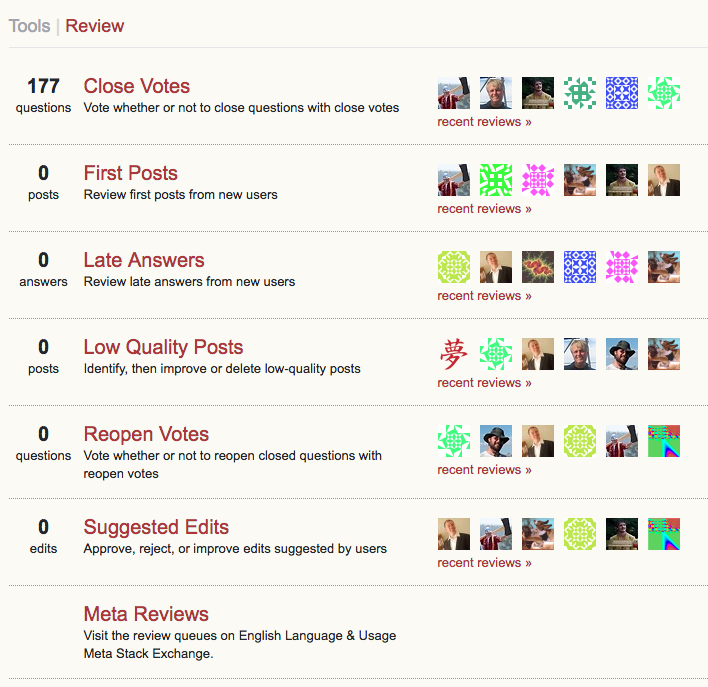 Notice how "answers" is on a different baseline from "votes" and "views". Notice how the first 3 is on a different baseline from the second 3. Notice how "answers" is on the same baseline as "votes" and "views". Notice how the middle 3 lines up with the 0 to the left and the 3 to the right. And notice, of course, that the 3 has a descender the way it is supposed to, consistent with our site theme. Actually they have completely lost the ELU styling and gained the bog-standard styling. This is a retrograde step. But even if the style of a left bar had to be adopted, I see no reason to change the colour. After all, the background colour of the page is specific to ELU, so there is a site-specific style sheet. And links have been underlined, although that might make sense for accessibility purposes. I can't see that introducing another colour into the site palette does that. I don't like the new theme. 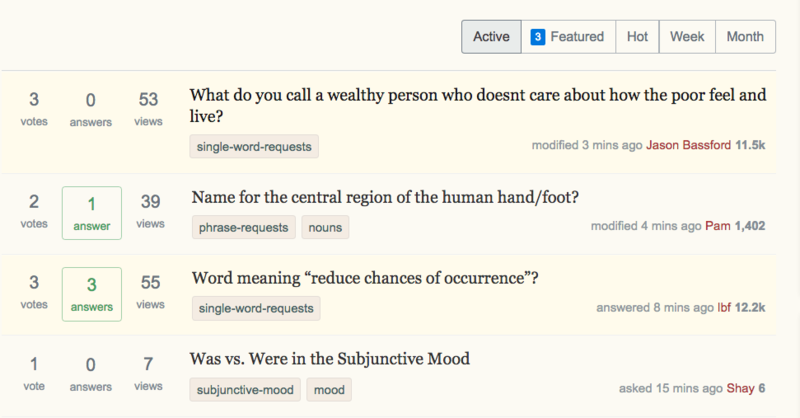 This answer focuses on the main page, the primary purpose of which is to display a list of questions. For before-and-after visuals, please refer to screenshots from Mari-Lou A's answer. Subjectively: the main page looks like a data listing. It no longer feels inviting. The gratuitous borders around the 'answers' number and 'active|featured|hot|week|month' draw attention away from the question text-blocks, which should be the highlight of the page. The font has shrunk. This might be to accommodate the extra nav-column, but I just bought a larger monitor as a concession to my aging eyes. Shrinking the font isn't welcome. The quoted text on the NEW theme is... yellow? What shade is that? I wanted to indent the quotation, however, two thick vertical lines appeared and are very conspicuous. Is this deliberate? This is how it appears on the ORIGINAL theme. The extra lines are horizontal but very faint. The colour of the quoted text is more soothing to the eyes. As a follow-on to Andrew’s observation that our colors don’t make sense now, I’ve found a related problem. 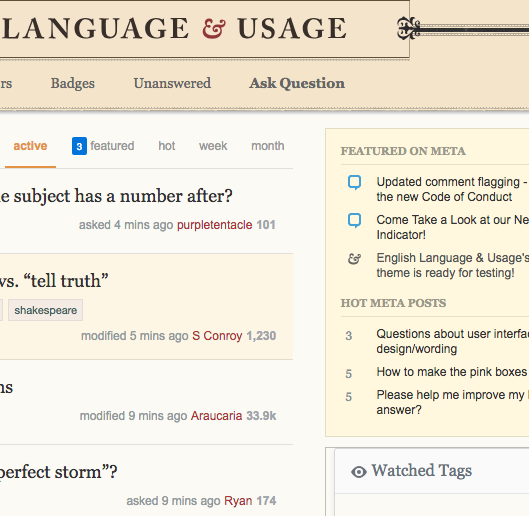 I have the old-english tag marked as an interesting tag, so that shows up in a distinctive color. What’s happened is that the tagged-interesting.background-color CSS value has gone from #fffbec before to rgba(255,245,222,0.7) now — so a #fff5de with a 70% opacity. The would-be “interesting” question is now virtually indistinguishable from the rest of them. As I observed in another answer of mine, you must run contrast-analysis tools on your color pairings to know whether they are usable. This one is not. This is a major contrast failure against our default background color, and cannot be seen. The tools I have available aren't professional-level and the font size might be adjusted in line with other sites in the SE family. I do think that the textured border to the masthead is good, and it's a pity it's currently lost because the superfluous box uses it. There's a border to the heading; it's not necessary to add more. An unadorned title can happily sit left-justified as here, or centred if that's what the mobile theme does. While I don't particularly like the new design philosophy (although it's still unstated, there's enough evidence of it around now) I do believe it's important to match it in its simplicity. But it's also hugely important — and, what's more, possible — to provide more than a nod to the heritage of the site in the design. I've looked hard online and not found the excellent original font Jin used, which would be preferred, so I've chosen something close in Letterpress Text. I'd like some image on the right of the header to match other sites (like Meta.SE, Music, Christianity and Academia, which I can see) but I don't think that text or book pages would physically fit well and still be obvious or legible. Perhaps it's possible to come up with something else. It wasn't broken; why did you fix it? Our measure (line length) is still set far too long to be comfortably read on the desktop site. Short story is that the measure should be set between 40 and 70 ens, with 66 widely considered comfy. Ours seems to be set at 100, which violates all known page layout rules. I’ve just posted about this on MSE because it’s a network-wide problem, not just ours alone. See this post on MSE for copious details and examples, including proposed fixes. The post-signature owner grid is sometimes too small. I used this question for reference. That’s still the wrong color, though. 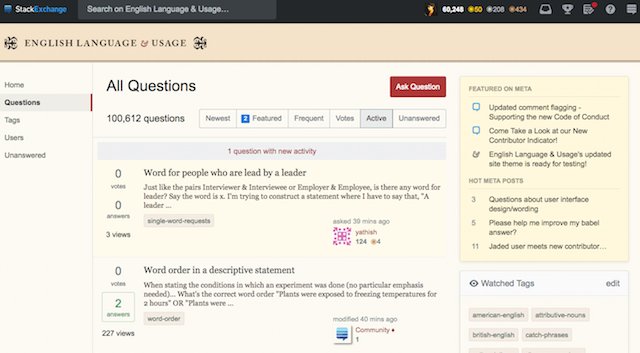 Notice how very much easier it is to read the serifed word ”answers” there in the old theme compared to trying to read the sans-serifed word “answers” in the new theme. Flip back and forth between my two images: it’s obviously much worse now. Also notice how in the new site theme, you’ve chosen a shade of green that has nothing to do with our site theme’s color palette. Too many colors makes things confusing and garish. Even worse, by switching from the dark-on-light figures to light-on-dark, you’ve run afoul of the webkit font smoothing problem that makes light-on-dark text all bold and blurry on a Mac under webkit. I’ve mentioned this problem here on MSE. It looks completely awful. I still don’t like that you’ve force-fed the wrong font on those score and view figures there, too. Proportional text figures are in keeping with our theme; tabular lining figures are not. Constructive suggestion: consider removing the boxy outlines. They are drawing attention away from the important content. I just today opted-in to new beta designs, and now I see the new EL&U design everyone is griping about. Maybe this isn't what you'd call constructive criticism, but: It's ... ugly. And I'm no design snob. I couldn't tell a Helvetica from a Garamond if they both bit me on the derriere. Which it seems like they have? Is the EL&U banner supposed to be off-center like that? Do we need the heavy ornamental box around it? Do we need "TOP QUESTIONS" in 48,000pt font? Why is that information so critical? Do the individual questions need to be so tall (i.e. big y value), so you can see so few at a time? Is it intended the almost-static right sidebar needs to be so conspicuous, at the expense of the central focus of the site, the question list? Do I need a huge box showing all my watched tags? I rarely if ever change them. 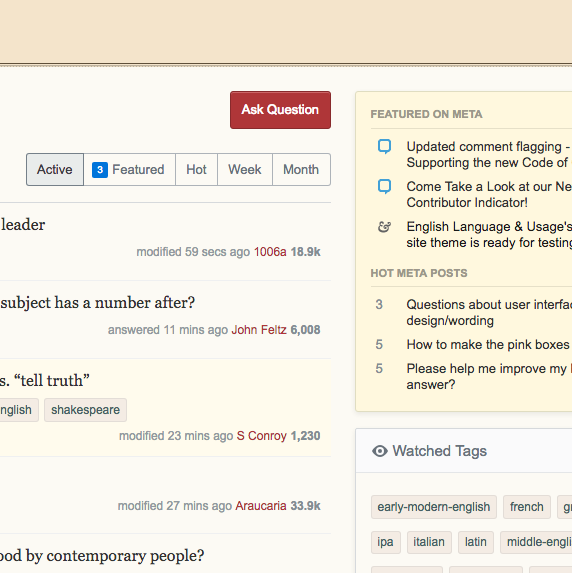 On the plus side, I super-duper like the much clearer and more conspicuous *ask question" button, in burgundy. That is a fantastic change. You can leave that one on my lawn. There are many things I don't like about it, but there were many things I didn't like about the old one, too. You make do with what you have. At least I try to. I don't like complaining. But there is one item of the new theme I'd like to complain about. Maybe it was there on the old one, too -- I haven't looked. That is the HOT META POSTS box on the right. I rarely look at either side -- that's where ads appear and I've gotten good at ignoring them on other sites -- but when I do look it's pretty damn silly. Badge tracking on profile page looks wrong (when completed). The track the next one and let us pick buttons (and their bounding box) appear too low and interfere with the tabs. C A N   W E   H A V E   T H I S   B A N N E R ? P L E A S E ? I saved the web­page on my lap­top, and when I opened the file some­thing won­drous oc­curred. The thick black lines had dis­ap­peared, and the lo­go im­me­di­ate­ly ben­e­fit­ted. Without that tug-of-war pole, the whole lo­go looks un­fet­tered, it’s eas­i­er on the eye. Am I wrong? More­over, I still dis­like the font used on “All Ques­tions”, it’s jar­ring. Why can’t we have the same font used in the ban­ner? Maybe less space between the left ornament and the text. The idea would be to carry the line across the page, or maybe have it end in another of the ornaments at the end of the main column (before the right column), or... something to add some enclosing elements to the name and some ornament to the rest of what is otherwise a dull expanse of tan. The text and beloved ampersand could also be just about the same size they are today on the pre-designed site. Maybe you have to shrink the image down to 95% or something, but there's room for it to be a lot bigger than it is now and I think that would improve site identity. I still dislike the general layout, and I feel that EL&U would benefit from a different colour scheme but the logo does look much better now (centred would be best). Thank you (the graphic team) for listening and fixing the logo. This isn't a bug per se, but while the programmers are working on the UI, would it be possible to keep the site banner (e.g. 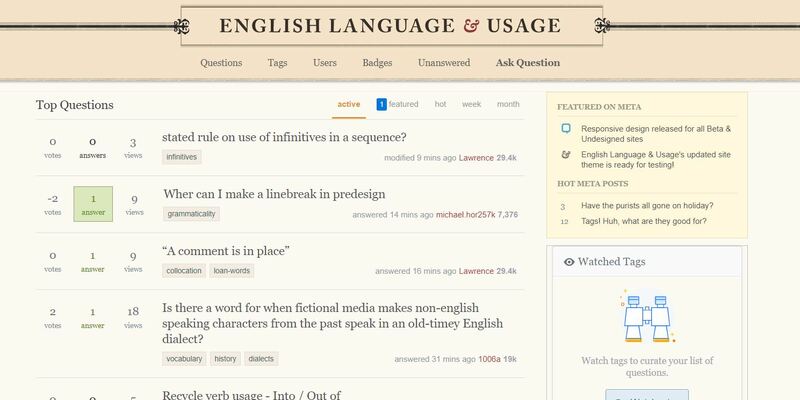 "English Language & Usage") in the top menu or left menu? Clicking on the banner is a natural way to return to the home page of the community. Currently, the site name scrolls away when scrolling down the page. 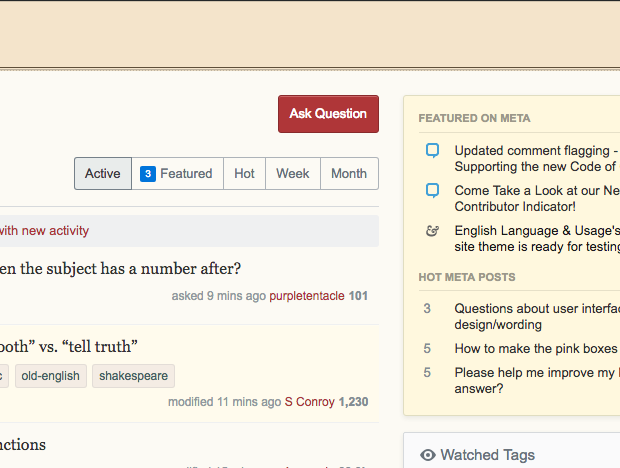 Also, this has bugged me forever, but can we have a link from a Meta question to the main site home? Clicking on the banner doesn't do it, and right now it's buried under the top-right hamburger menu.